JAYAPURA CITY - New Zealand’s indigenous Maori people expressed their support for the people of West Papua by performed an action at Pasifika Festival in Auckland. 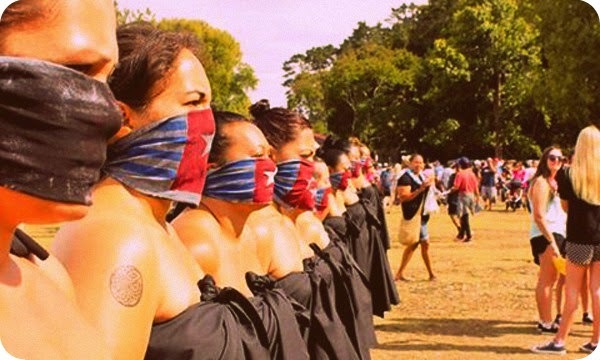 Fourteen Maori women in traditional attires performed the ‘Oceania Interrupted Action 3: Free Pasifika – Free West Papua with a small Morning Star flag covering their mouths . The performers are Marama Davidson, Ruiha Epiha, Talafungani Finau, Lelani Kake, Moe Laga-Fa’aofo, Genevieve Pini, Amiria Puia-Taylor, Leilani Salesa, Luisa Tora, Mele Uhamaka, Asenaca Uluiviti, Leilani Unasa, Julie Wharewera-Mika, Elyssia Wilson-Heti. “Our mouths are sealed with the Morning Star flag symbolizing the enforced silence of West Papua.,” a performer, Marama Davidson told to Jubi by phone on Sunday (9/3). They both further said that their tied hands symbolized a lack of freedoms experienced by West Papuan people. They restricted their movement and kept silent during the performance as a symbol of lack of freedom to express political opinions, lack of access to equal and equitable resources, and lack of access to free and independent media experienced by West Papuan people. They also adorned their bodies with black color as a celebration of the existence of women as well as a mourning symbol.